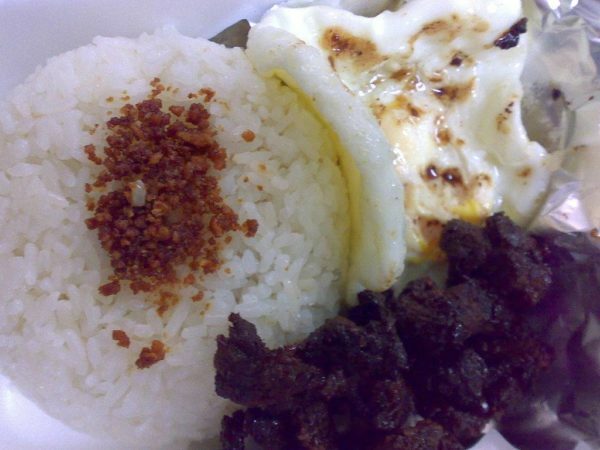 Tapsilog (tapa, egg and fried rice) is a popular breakfast meal among Pinoys. Although it is primarily served during breakfast, many Filipinos prefer to eat it any time of the day. The presence of countless tapsilog businesses in almost any place in the country is one proof that it is among the many booming businesses in the Philippines. Aside from serving tapsilog, many tapsilog businesses also offer other silog (friend rice and egg) meals including longsilog, hotsilog, hamsilog, chickensilog, among many others. Tapa, which refers to cured beef, pork or chicken, is best served when fried or grilled. Although beef tapa remains to be a popular choice, pork tapa is a cheaper alternative but is similar in taste and texture. Here’s a simple recipe on how to prepare pork tapa for your tapsilog business. Select good quality pork, preferably with big muscles and minimum fat. Slice into 1/4 inch thick. Mix meat with curing ingredients until it becomes sticky. Add extenders. Mix again until the meat dries up. Add the seasonings and mix thoroughly to evenly distribute the ingredients. Put in a white container. Make sure to loosen the cover and cure at room temperature for 8 to 10 hours. You may opt to refrigerate in the middle compartment with a temperature of 1 to 4 degrees overnight. Mix again before putting in a package.